Stop Mother Nature from wreaking havoc on your pavement. 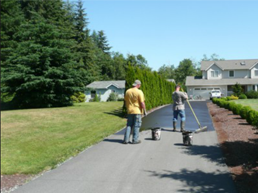 Our contractors in Everett, Washington, offer an affordable and premium sealcoating service. 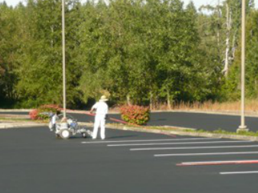 Extend the life of your asphalt by sealcoating it. Asphalt pavements are made up of stone, fine stone or sand, and asphalt binders. Binders give the pavement its black appearance. In fact, it is the glue that holds everything together. Leaving asphalt unsealed is the same as not painting your house. Through sealcoating, you preserve your asphalt and protect it from damage caused by the elements. Given enough time, pavement becomes brittle and has less resistance to the loads placed on it. This can lead to a multitude of problems. Asphalt is a petroleum product. Any other petroleum derivative that contacts it will penetrate the asphalt, weakening or dissolving the asphalt’s glue-like properties. These substances commonly include motor oil, other vehicle fluids, and gasoline. A high-quality sealcoating product protects the asphalt pavement from damaging factors while providing the curb appeal of a new-looking black surface. Sealcoating also seals in the beneficial properties of the asphalt cement. Research has shown that proper maintenance, including sealcoating, can double the life of an asphalt pavement. Sealcoating is not new by any means. The first sealcoating materials were developed in the 1930s for Standard Oil® to protect the pavement in their service stations.